Do you struggle with your hair on holiday? Sunshine and swimming can play havoc with your hair. Though most of us wouldn’t dream of jetting off to the sunshine without a bottle of high protection sun cream, how many of us remember to pack protection products for our hair? After a few days of sun and sea, even the most healthy, glossy hair can deteriorate into a frazzled mess if it’s subjected to the elements with little or no protection. 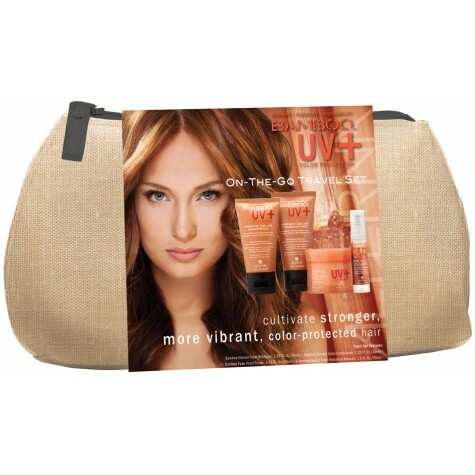 That’s why we love the Alterna Bamboo mini travel kits…. Bamboo on-the-go travel sets – Nobody wants to pack big, bulky bottles, tubs, cans and tubes of hair products when they go on holiday – not when there are clothes, shoes and accessories to fit in! The solution? 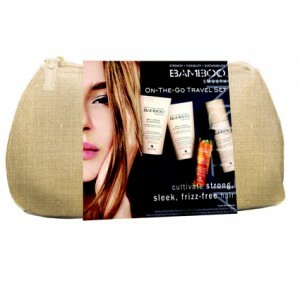 Try an Alterna Bamboo Travel Pack. Each of the Bamboo ranges – Smooth, Volume, Colour Hold+, Shine and Style – has a handy travel-size kit, containing the essential items from the range. Presented in a beautiful zipped bag, they are perfect for keeping your hair under control whilst on holiday or on short trips away from home. Buy in salon or online. Happy holidays! Here are some more of our top tips to protect your hair from the potentially harmful effects of the sun, sea and chlorine filled swimming pools, to help you ensure your hair looks gorgeous both on and off the beach…. Colour – If you’re planning to have your hair highlighted before you go on holiday, ask your hairdresser to make the highlights two or three shades darker than normal. The sun will naturally lift your hair colour those extra shades. Cut – Book an appointment to have your hair cut before you go away, even if it’s only for a trim. This will ensure that any dry or split ends which are especially prone to damage, will be removed before you spend time in the sun. Condition – It’s a good idea to treat your hair to regular deep conditioning treatments a couple of weeks before your departure date, so that it’s in peak condition for your holiday. We recommend Alterna Caviar range. Continue the treatments every three or four days while you are away and then every three to four weeks after you get back, to maintain the hair’s moisture levels. Cover up – Try and keep your hair covered up as much as possible when you are out in the sun – ideally with some kind of scarf or hat. The sun’s UV rays can damage your hair as well as your skin, especially if it is coloured or highlighted. Protect – Whenever your hair is left uncovered, get into the habit of applying a protective product. We recommend L’Oreal Solar Sublime as it contains SPF and special UV filters. Rinse – Rinse your hair with fresh water after swimming in the sea or pool, as both salt and chlorine dry hair out. You can always use bottled water if there are no showering facilities nearby. Wax – Hair that’s prone to frizziness is especially vulnerable in a warm, humid climate. Rather than try to straighten your frizzy holiday curls into submission (which will only have the effect of drying your hair out even more), make the most of them by transforming the wild frizz into soft tousled curls, with the help of a good water soluble styling wax or cream. L’Oreal and Alterna have an amazing choice of products, ask your stylist next time you’re in the salon which product would be suitable for your hair. String it up – Secure unruly holiday hair into a simple but fashionable ponytail, securing it with damp twine or string. Unlike a rubber band, string won’t snag the hair and as it dries, you should find it tightens to create a secure fix to keep your style in place. Plait it – The season’s trend for plaits is good news for holiday hair. Plaits are a perfect for when you’re sitting on the beach or relaxing by the pool. They’re also really easy to do and great for keeping your hair under control.